When we first shared our green freight vision two years ago, we had a few concerns. How can green be applied to the most polluting industry on earth without skepticism? How can we do it? How quickly can green freight technology catch up? Do our partners, investors and customers care? With these questions, we started to reach out and connect with people, companies and organizations working on solutions for cleaning and greening freight transportation. We collaborated with Climate Change—The New Economy in London and Eric Beckwitt, Freightera’s CEO, wrote the Green Future for Freight thought leadership article for the 2016 G7 Summit. He later presented it at the COP22 UN Climate Change Conference in Marrakech in 2016, and in the same year we were selected by SmartWay and Natural Resources Canada to feature certified lower emission carriers in our North American freight marketplace. 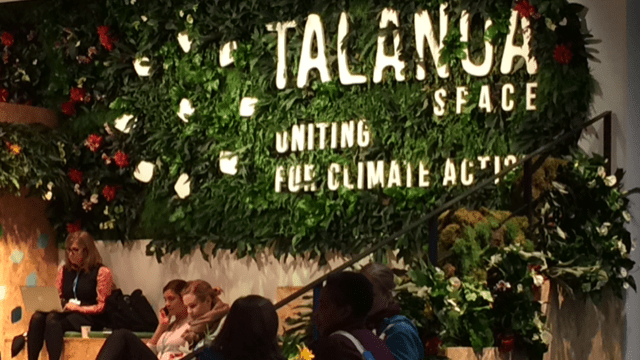 Just a week ago we returned from the COP23 Climate Change Conference in Bonn, Germany, where we went to listen and learn what others are doing and to continue connecting with scientists, companies and government officials working on reducing emissions from transportation. It was great to see how much attention the transition to green transportation is receiving globally and how change is happening now. We met with one of Freightera’s counterparts from China, Transfar, working with the Zhenjiang Center for Climate Change and Low-Carbon Development Cooperation, to solve very similar problems through truck space optimization, filling empty trucks and shifting road freight to rail and waterways. We listened to presentations by Bosch and Philips Lighting, sharing their success in greenhouse gas (GHG) emission reduction, their targets and how they are getting there. We discussed with the leading companies how we could collaborate in greening their supply chains. 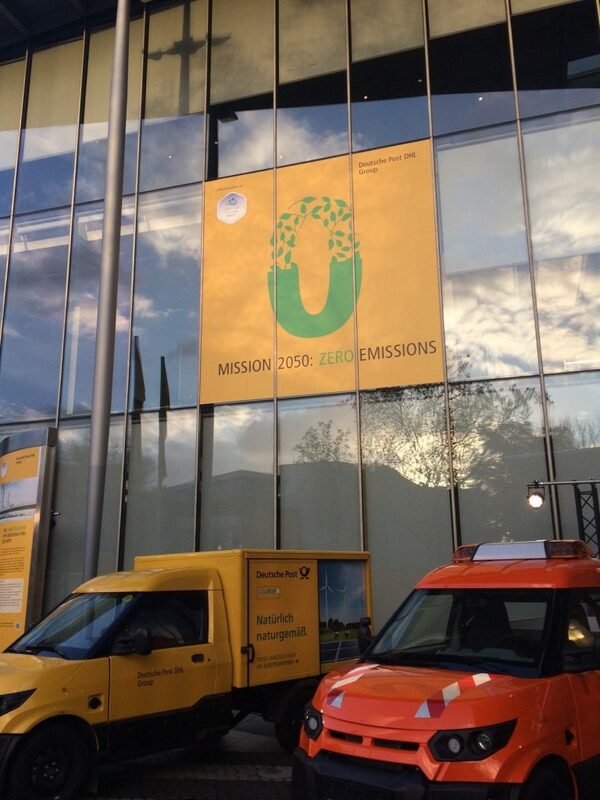 Perhaps the most exciting and meaningful contributor to Green Freight that we see emerging in the industry is the Deutsche Post DHL Group. 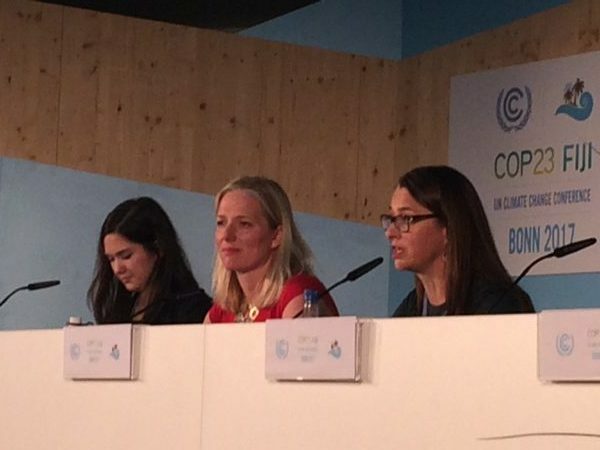 They are committed to cutting GHG to 0 by 2050. Once they set their goals, they found themselves in the situation where they had to design and manufacture their own no-frills electric delivery vehicles, and they have done it very successfully. Peer Bentzen, EVP Business Development at Deutsche Post DHL Group, says jokingly, that they are now the Tesla of Europe. Awesome move. 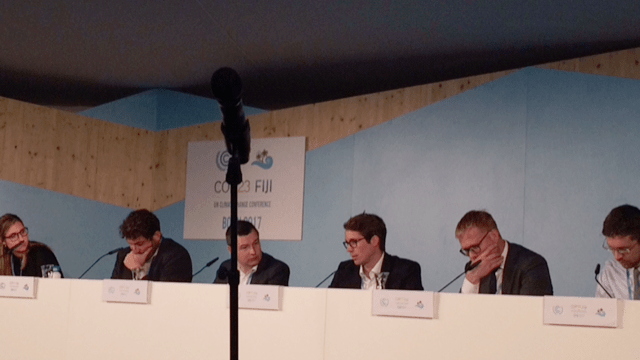 It’s been great for us to watch the shaping of agreement among participants, speakers and panelists at COP23 that the future of freight is electric. Benjamin Wickert, Head of Business Development with Siemens’ ground-breaking eHighway project believes that it’s not just electric, but renewable electric, and we agree with that. It’s great to see that freight electrification is a trend well beyond the COP23 Climate Conference discussions. In the background of COP23 in Europe, Tesla just announced their plans for an all-electric freight semi-truck, days later followed by Mercedes-Benz push to step up production of their electric vans. Wal-Mart and J.B. Hunt are already pre-ordering Tesla’s semi-trucks. The future of road freight is electric. The question is how fast can we move towards it. 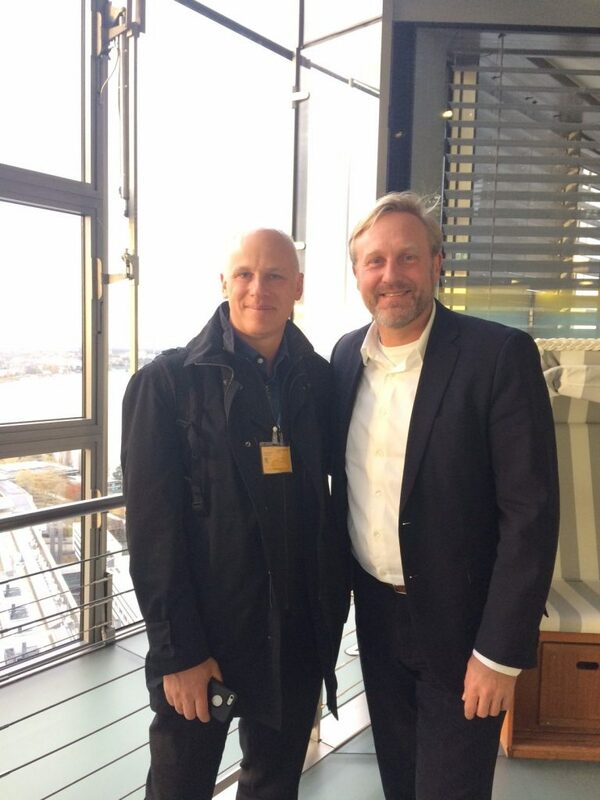 Peer Bentzen, EVP Business Development, Deutsche Post DHL Group, and Eric Beckwitt, Freightera CEO. Deutsche Post DHL Group’s own electric delivery vehicles. 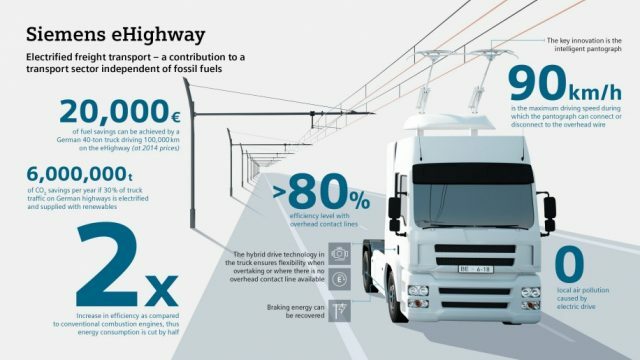 Siemens’ eHighway system combines the efficiency of electrified railroads with the flexibility of trucks. “More freight but lower emissions: Too good to be true?” panelists: James Nix, Transport & Environment, Eric van der Schans, Port of Rotterdam, Benjamin Wickert, Siemens eHighway, Sergio Barbarino, P&G, Esther Toth-Weedon, Smart Freight Center. Moderator: Edward Cameron, WBCSD. 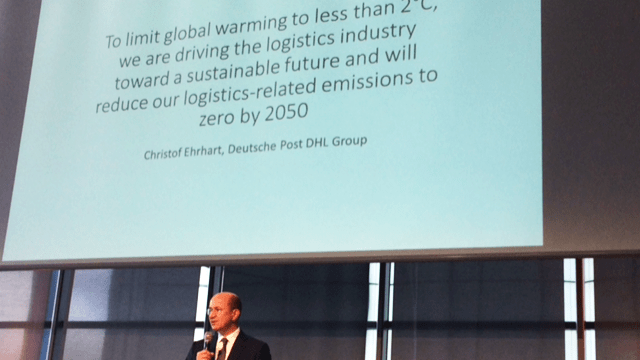 Deutsche Post DHL Group committed to reduce logistics related emissions to zero by 2050. Canadian Minister of Environment and Climate Change Catherine McKenna at the briefing for Canadian delegation. 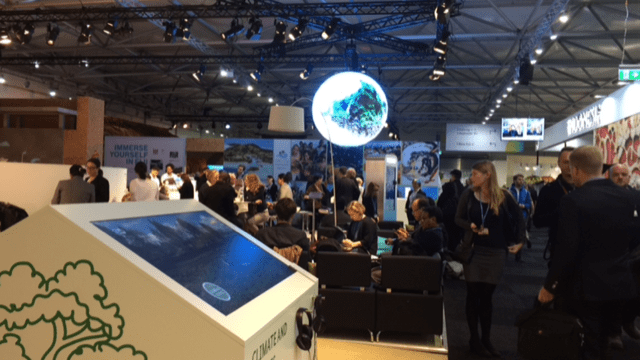 COP23 UN Climate Change Conference, Bonn Zone, space for dialog. COP23 Climate Change Conference, where governments, businesses and NGOs collaborate.